Via Shell > Edit shell configurations, you can edit and add shell configurations. This allows you to for example select the initial directory, or use a custom PYTHONPATH. name: the name of the shell config. exe: the executable for the Python interpreter to use. Use the dropdown menu to see what interpreters were detected by Pyzo. 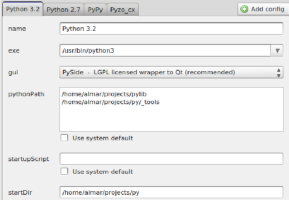 ipython: whether to use the IPython shell or not. gui: The gui toolkit to use. Enabling this allows you to do interactive plotting. By default this value is set on "auto". pythonpath: provide a directory name on each line. These directories are used by Python to search for modules. startupScript: a script to run at startup. You can also just write a few lines of code here. argv: simulate command-line arguments passed to the interpreter. environ: environment variables to pass to the interpreter.